The smell of smoke permeated the main street of town this morning. It drifted up from the foreshore to let us know in which direction to head. Not a warning of a smouldering scrub fire to avoid or a blazing bush fire to flee, this was welcome smoke — a welcome to country. Our little Rock is in the marr ne bek — 'excellent country' — home of the Kulin clans. We are in Boon Wurrung territory, a place of plenty. But very few indigenous Australians live here. In my time on The Rock, I've met none. the welcome to Boon Wurrung Country with a smoking ceremony. Aboriginal Australians make up a mere three per cent of our nation's population. But that's a story for another time. Today, we acknowledged the indigenous ownership of our home and we celebrated the connections between our community and many others. A Smoking Ceremony cleanses a space, prepares it for a significant event. The smoke connects all present to both the physical world, the spirit world, and to each other. Indigenous Australians have always used fire in caring for their land and people. Bushfire promotes new growth in native flora. Lush grasses and freshly shooting trees attract animals for hunting. It's all connected. Planned. Respectful. Smoke is a symbol of healing and well-being. Land. Fire. Smoke. Growth. It's a perpetual cycle. The Rock is also home to the Yolla. Early settlers dubbed them Muttonbirds because they provided large and fleshy meals — like flying sheep. We call them Short-tailed shearwaters. A million of them have their rookeries here on The Rock. Every year, they travel 15,000 kilometres from the Aleutian Islands in the Bering Sea near Alaska to reach us. In November, each female lays her one precious egg. Her partner shares in both the incubation and the caring for the young, travelling as far as the freezing waters of Antarctica in search of food. And then, in April, when the winds blow, each pair makes the return journey. When strong enough, the chicks set off too. For a few weeks, no lights illuminate our streets or the bridge leading to The Rock. They confuse the birds. And many of us find fledglings that have simply dropped out of the skies. Disoriented and exhausted, they fall onto our porches. 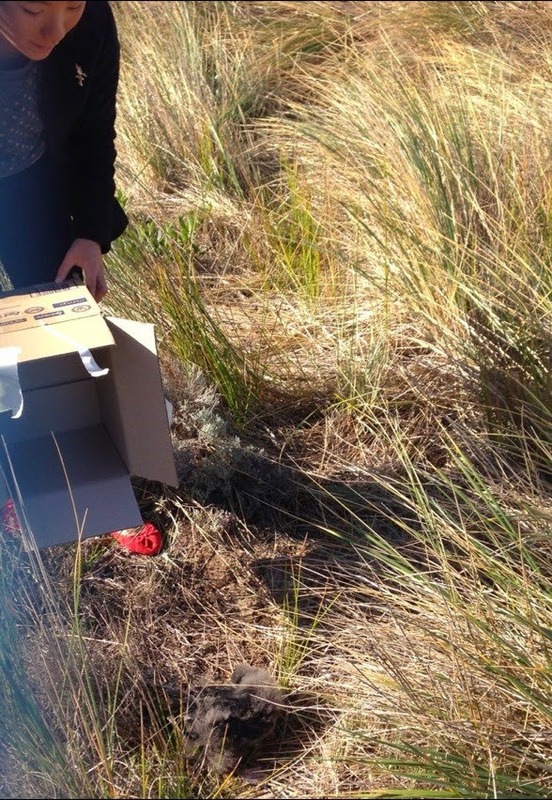 Girlchild releasing one of our young Yolla visitors into the dunes near our house earlier in the year. This weekend in the Shearwater Festival, our little community enjoys activities and performances that celebrate creative, cultural and environmental interconnectedness.There is a street parade, workshops led by indigenous artists, nature walks conducted by local park rangers, and concerts by some of Australia's most prominent Aboriginal musicians. It all kicked off with a dance troupe and a giant Shearwater puppet telling the migration story on the foreshore. They interwove the Dreamtime creation tale of Bunjil the Eagle with the legend of the shearwaters as Bunjil allowed safe passage to these migratory birds that choose our Rock. Sometimes,I feel totally inadequate with my 'privileged' WASP heritage. Beyond inadequate...ashamed. Impoverished. Thank you for sharing about this excellent country! I appreciate hearing of life from another corner of the world. I totally know what you mean when you say you sometimes feel totally inadequate in your WASP heritage - me too. We have Thanksgiving coming up in the US where the white people celebrate the Native Americans sharing their bounty with us and teaching us how to farm, essentially saving us from starvation, and in return we all but killed them all over the next century or two. It's an odd holiday for an inadequate WASP woman like myself. But I guess we can't help what bodies we were born into, either - so we can just do our best to honor life and our interconnectedness. Welcome indeed, Shanti. So glad you found me and took the time leave a comment. I'd never thought about the connection between Thanksgiving and the Indigenous Americans. I always thought it was just for the pilgrims and the founding fathers. And yes, we did the same to our Aboriginal population. Wendy off her rocker suits me very well, actually. I'm happy to own that one. Thanks. The shearwater puppet was wonderful, Mary-Anne. It was created as a community art project. Kind of funny tat after my rant about non-fiction being creative, this post presented itself.